Michele Bondesan was born on 10 November 1994. He begins studying the drums at the age of 9 at the Fondazione Siena Jazz under the guidance of Alessio Riccio, continuing and deepening his academic and professional practice for about nine years by attending the musical courses of the same foundation, playing in various projects and attending many workshops and masterclasses, such as the Brazilian music ensemble “Labyrinto”, a workshop about improvisation, musical research and live electronics with Tobia Bondesan and Cristiano Bocci (under the teaching of Alessio Riccio), and the summer seminars “Tuscia in Jazz” with Antonio Sanchez and Francisco Mela. 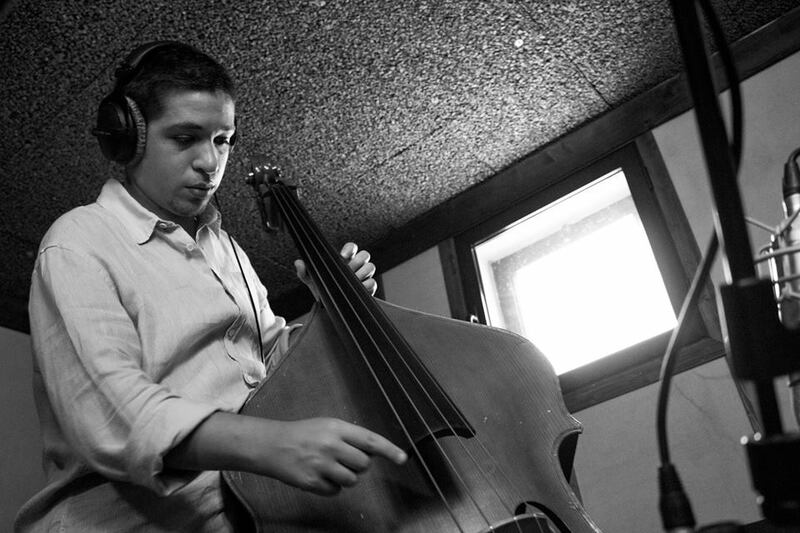 At the age of 14 he approaches the study of double bass, partecipating in the “Peter Pan Orchestra”, a propaedeutic musical project for children organized by the Fondazione Siena Jazz and taking lessons with Silvia Bolognesi, both privately and in the latter Academy, where he plays in the ensemble classes of the teachers Mirco Mariottini, Ettore Bonafè, Francesco Petreni, Alessandro Giachero, Klauss Lesmann, Giovanni Falzone and Marco Tamburini. In 2011 and 2014 Michele takes part to the Siena Jazz summer workshops, where he has the opportunity to perfect his abilities with musicians such as Paolino Dalla Porta, Furio Di Castri, Anders Jeormin, Omer Avital, Matt Penmann, Achille Succi, Joel Frahm, Avishai Cohen, Michael Blake, Simone Graziano and Stefano Battaglia. In the same years he gets in touch with totally improvised music, contemporary music and conduction through lessons and masterclasses, partly thanks to ﬁgures such as Silvia Bolognesi, Piero Bittolo Bon, Massimiliano Sorrentini and Stefano Battaglia. He ﬁgures in 2013 among the musicians who provided the sound material for the realization of “Instruments”, an album by Cristiano Bocci, mathematician, musician, improviser and composer of electronic music. As for the professional activity in the jazz ﬁeld, Michele plays in numerous projects in the Tuscan and national territory such as the “Uroboro Open Collective”, “Fabbrica5” (with which he records the homonymous album, published by “aSimpleLunch Records” ), “Brotherhood Duo”, “BlueRing Orchestra” (with which he recorded the album “Bluering VOL. I”, published in 2018 by “Rudi Records”). Umbria Jazz (with the Fabbrica 5 project, as third-place winners of the national contest Conad Jazz Contest ), Fara Jazz Festival and many others. Together with his brother Tobia he founds “Bluering – Improvisers” in 2014, a collective author of a series of monthly meetings of radical improvisation, workshops and concerts, which in the course of a few years has achieved a notable number of musicians and audience, and the “BlueRing Orchestra”, a vast orchestral ensemble focused on the practice of free improvisation and conduction with which he performs regularly, until the recording of the ﬁrst album in the summer of 2016, published by Rudi Records. In 2015 he takes part in the “Permanent Research Laboratories” of Stefano Battaglia. In 2010 Michele begins also the study of classical double bass at the “R. Franci” conservatory of Siena, under the guidance of M. Andrea Granai, attending the ﬁrst level degree course in double bass. In classical music he has the opportunity to play in various contexts, such as Greve in Chianti Chamber Orchestra, with which he participates to a short tour in Austria, performing in several concert halls in the city of Salzburg and at the Lamole festival, Orchestra Poliziana del Cantiere Internazionale dell’Arte of Montepulciano, playing with M. Luciano Garosi and M. Roland Boer in the realization of the ﬁrst of contemporary opera “Brimborium” by Mauro Montalbetti and the “Orfeo” by Gluck, the MiC Ensemble, a chamber orchestra composed of young professional musicians selected in the major tuscan conservatories, Orchestra Toscana dei Conservatori, Galimathias Ensemble, with whom he performs at the auditorium of the Violin Museum of Cremona, at the biennial “Baroque Conference” and at the inaugural ceremony of the fair “Mondomusica” in 2018, the Orchestra Regionale Toscana, directed by M. Daniele Rustioni, Orchestra Senzaspine (also directed by M. Luciano Acocella in the “Amiata Piano Festival”) and Orchestra Giovanile Italiana. He starts teaching in 2017 in the school of music “Mapacanto” in Cremona, where he also organizes “Pangea: Improvised Chamber Music Workshop”, a masterclass about improvisation and extemporary composition that takes place every month for the whole year, held as a teacher and aimed primarily at classical and contemporary musicians. Michele also founds “ISAR” (Impro Summer Artist Recidency) in 2017, an intensive workshop of a few days about impromptu composition and contemporary music, participating as a teacher together with his brother Tobia and the drummer and percussionist Giuseppe Sardina, continued with a second extended edition in 2018, with the addition of guitarist Claudio Riggio. In 2017 he begins the biennial second level degree course in classical double bass at the ”Peri – Merulo” conseratory in Reggio Emilia, studying with M. Amerigo Bernardi and M. Alberto Bocini. In 2018 he wins the audition and plays in the Orchestra Giovanile Italiana and Orchestra Senzaspine.